Flowchart of the study design and classification. 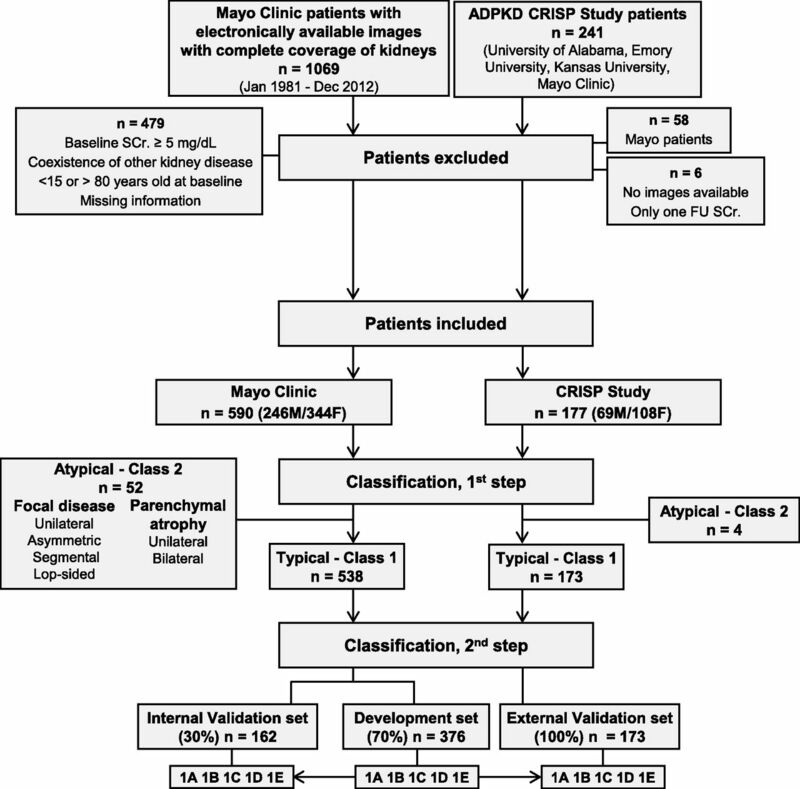 We reviewed electronically available abdominal CT or MRI of 1069 patients with ADPKD from the Mayo Clinic, of whom 590 were classified as having typical ADPKD (class 1) or atypical ADPKD (class 2). The 538 class 1 patients were randomly partitioned into a development set (70%) or an internal validation set (30%). Assuming a theoretical starting HtTKV of 150 ml/m and a yearly increase of 1.5%, 3%, 4.5%, or 6%, HtTKV limits were calculated for each age in the development set. Patients were then subclassified as 1A–1E on the basis of the HtTKV for their specific age. The same classification criteria were applied to the internal validation set. In addition, the images from 177 non-Mayo CRISP participants were reviewed and 173 were classified as class 1 to form the external validation set. Atypical patients (class 2) were subclassified as 2A or 2B according to imaging characteristics (Supplemental Figure 1, Table 1). FU, follow-up; SCr, serum creatinine. 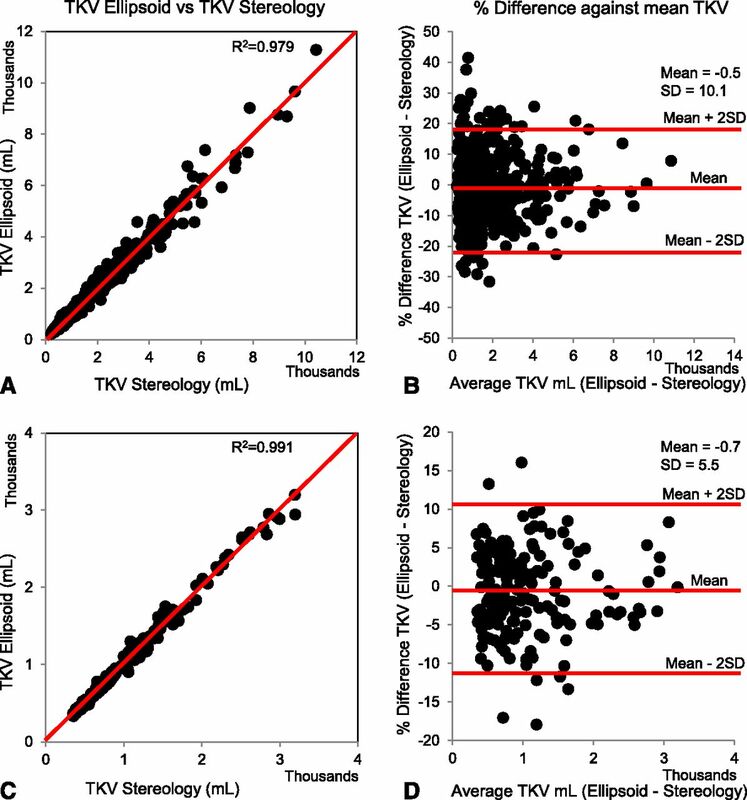 TKV by ellipsoid correlates strongly with TKV by stereology. Comparison of TKVe from CT or MRI versus TKVs in the MTPC (A and B) and CRISP (C and D) cohorts. TKVs and TKVe were strongly correlated (A and C) without systematic under- or overestimation of TKVe (B and D) in both cohorts. In 175 of the 590 MTPC patients (29.7%; B) and in 10 of the 177 CRISP patients (5.6%; D), the percentage difference between TKVe and TKVs exceeded 10%. The difference exceeded 20% in only 5.9% of the MTPC and in none of the CRISP patients. Equation derived from the development set predicted eGFR in both validation sets. Prediction of eGFR in patients with class 1 ADPKD: internal (A and B) and external (C and D) validation sets. 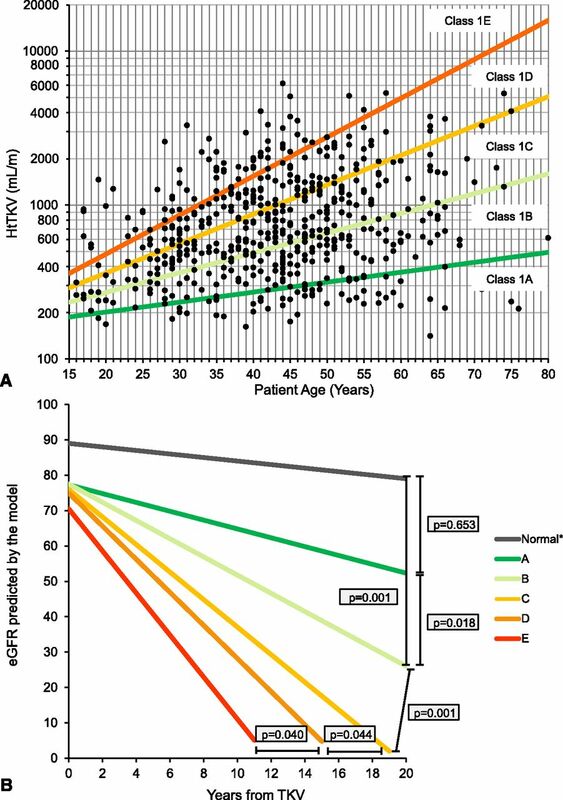 (A and C) Scatterplot of the observed eGFR (estimated by Chronic Kidney Disease Epidemiology Collaboration [CKD-EPI] equation) versus the predicted eGFR derived from the model obtained from the development set. Ellipse represents the 95% CI. 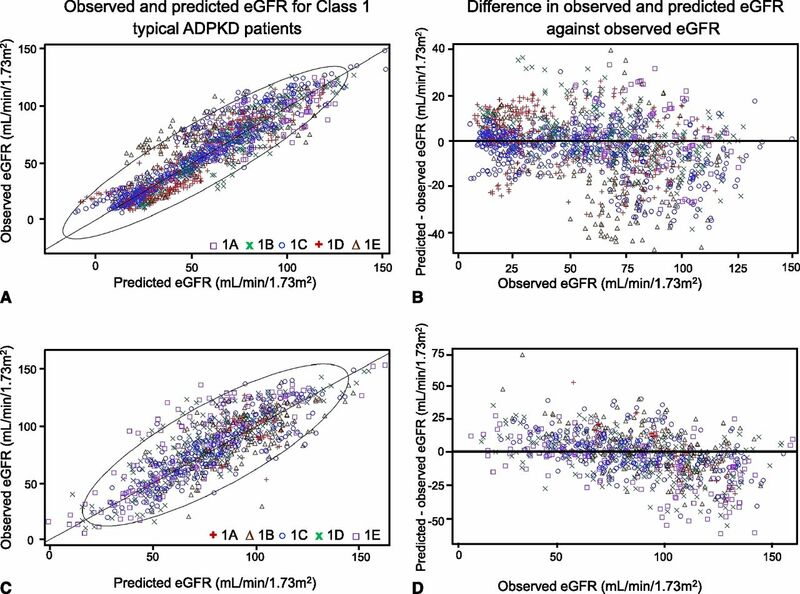 (B and D) Differences between predicted eGFR by the model and eGFR values by the CKD-EPI equation plotted against the eGFR values by CKD-EPI equation. The average predicted errors were 13.5 and 17.1 ml/min per 1.73 m2 in the internal and external validation sets, respectively, and were lower for patients with an observed eGFR<60 ml/min per 1.73 m2 than in those with an observed eGFR≥60 ml/min per 1.73 m2 (10.1 and 14.9 versus 16.2 and 17.7). 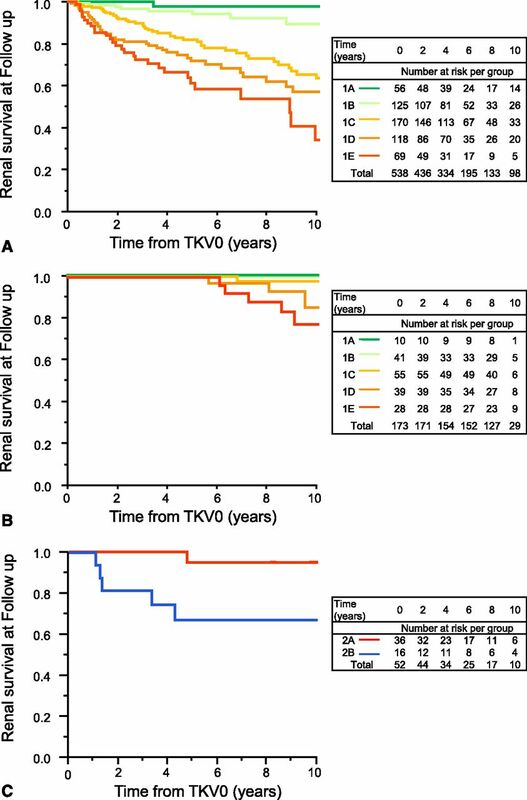 Classification by HtTKV0 and age at HtTKV0 predicts renal survival in class 1 patients. Kaplan-Meier survival plots of time to ESRD by subclasses in the class 1 MTPC (A) and CRISP (B) patients and for the class 2 MTPC (C) patients. Classification remains stable in most patients over time. 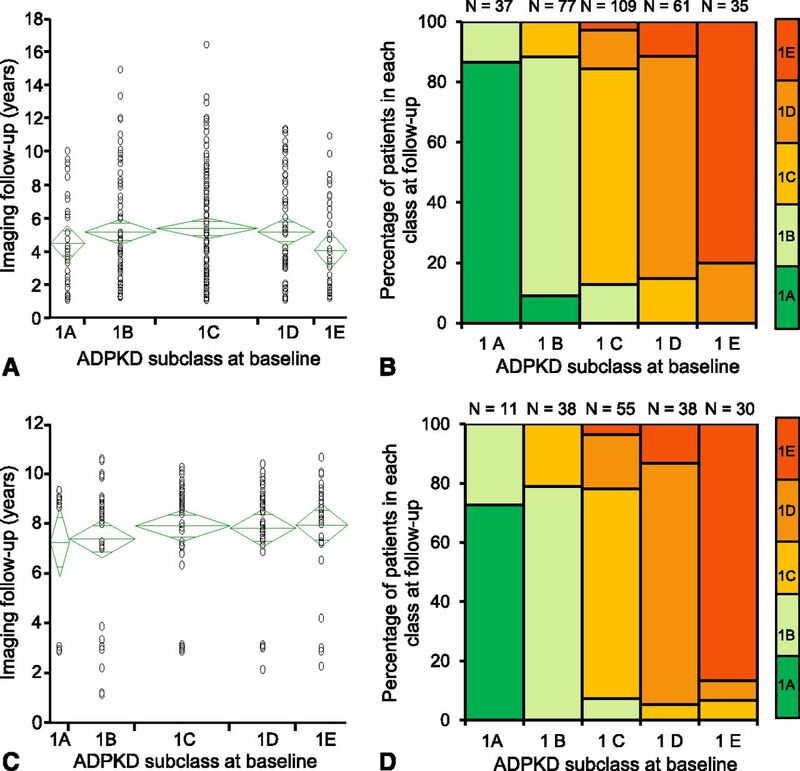 Years of imaging follow-up and stability of patients with class 1 ADPKD. Years of imaging follow-up (A and C) and stability of patients with class 1 (typical) ADPKD (B and D) during imaging follow-up period in MTPC (A and B) and CRISP (C and D) patients. Most MTPC and CRISP patients remained in their baseline classification. A few patients moved to the immediate lower subclass, whereas some progressed to a higher class, in most cases the immediate higher class, at the end of imaging follow-up. ↵a Reference is subclass 1A. Patients were subclassified based on HtTKV ellipsoid.